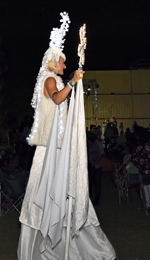 If you're looking for high impact roving entertainment or a stunning entry statement to your event, our stilt walking characters are simply perfect. Our performers are fun and engaging, the costumes are visually stunning and your guests are sure to be impressed. Click on the images below to see an enlarged version of the photo. 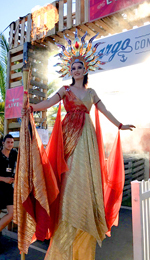 Surya is the perfect stilt walking character to warm up your event. 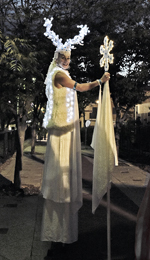 At almost 3m tall, she stands well above the crowd catching everyone's eye with her spectacular mirrored head dress. 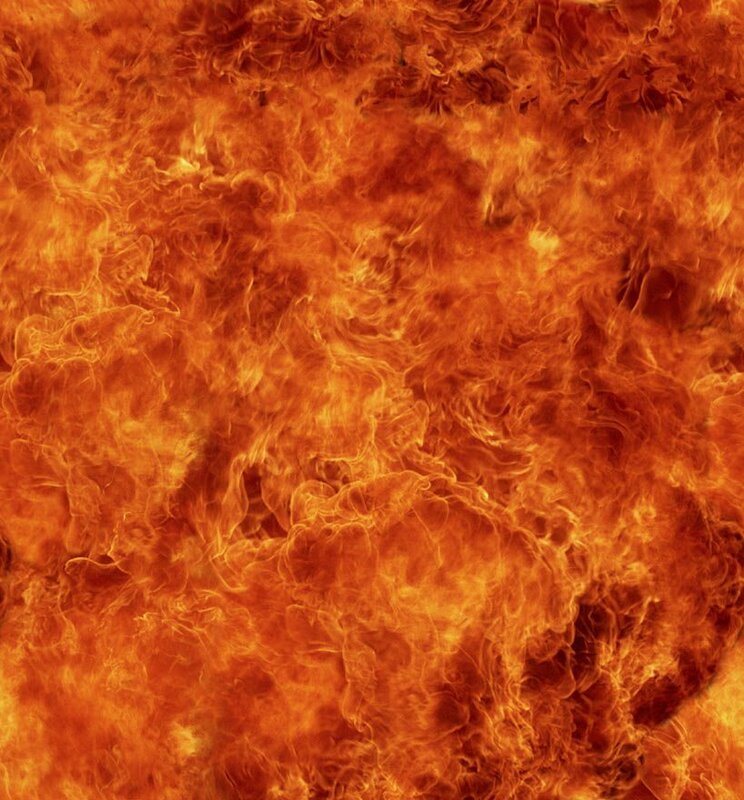 She wears a floor length, shimmering gown and carries a staff with a continuous burning flame. 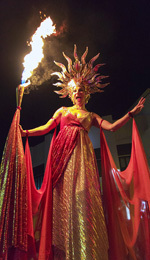 The staff also shoots 1m high jets of flame into the air, surprising and delighting guests wherever she goes. Surya is ideal for any event where you would like to bring a sense of warmth and excitement. Perfect for winter festivals, chilli festivals, spicy food fairs and street festivals. She's also a fantastic entry statement to guide your guests to their venue and provide an exciting visual welcome. Guests love to pose for photos with this unique and fiery goddess. 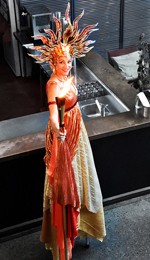 Surya can be booked for day or night events, as the reflective and shimmering costume looks amazing in the day and is beautifully illuminated at night, by the flame of her fire staff. Location: Outdoor or indoor. Indoor venues must have high ceilings at least 5m high e.g. Perth Convention and Exhibition Centre, Crown Ballrooms etc. Best suited to: Large events like festivals, conferences, balls and outside venues, bars and nightclubs. Luna is the queen of cool with with a warm heart. Like Surya, she is 3m tall, stands well above the crowd and catches everyone's eye with her wonderful horns. Her gown is floor length and pristine white. She wears a soft, woolen vest and carries a snowflake staff. 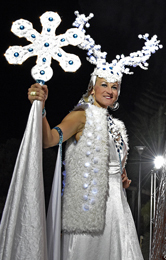 The horns, vest and staff are all adorned with lights, to make her look stunning day or night. Luna is ideal for any event with a cool or winter feel. Perfect for winter festivals, Christmas events and ice themed balls. With her high visual impact, she's also a fantastic entry statement to guide your guests to their venue. Location: Outdoor or indoor. Indoor venues must have high ceilings at least 3.5m high. "I just wanted to say a huge thank you for attending the Chilli Festival – it was a very hot day and I really appreciate how much harder stilt walking and wearing that unbelievable costume must have been. I hope it was a fun day for you and we hope to see you again soon!" 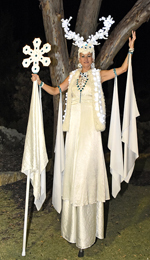 "Thank you for your wonderful stilt walker, it was a pleasure having her at our event!"